After getting married, the first document provided to you is the Local Civil Registrar (LCR) copy of your Marriage Certificate. This is available 15 working days after your date of marriage. 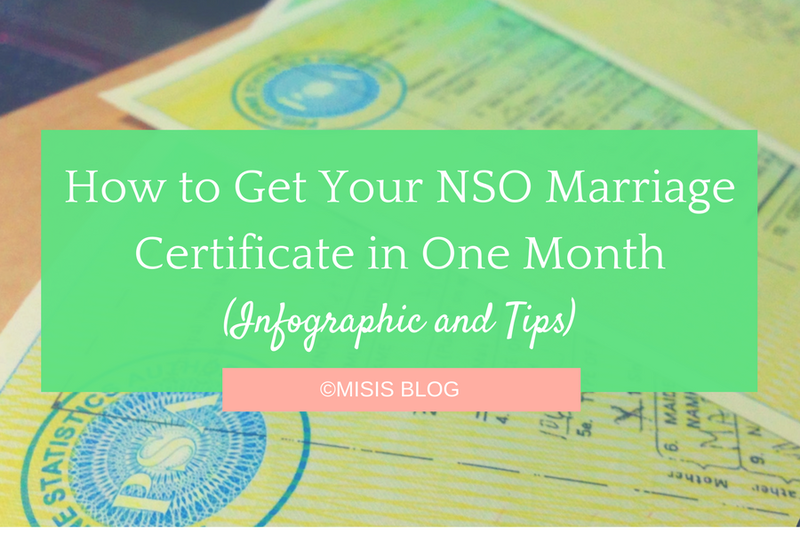 It takes about 6 months to 1 year for your NSO Marriage Certificate to be available. DISCLAIMER: I am not an employee of PSA/NSO nor an agency. I am a blogger who is only writing my experience. Please take time to READ the entire article; all the necessary information are here. If some information are not stated here, please contact your nearest PSA/NSO office. 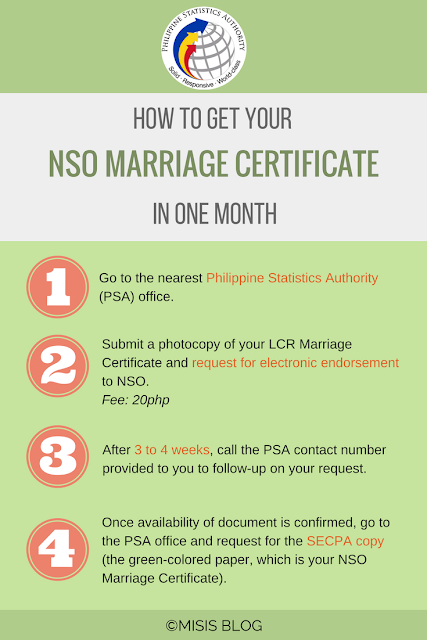 Here's how to get your NSO Marriage Certificate in just 1 month through electronic endorsement. 1. Go to the nearest Philippine Statistics Authority (PSA) office. You can check the directory here: PSA Directory (includes contact numbers). 2. Submit a photocopy of your LCR Marriage Certificate and request for electronic endorsement to NSO. Fee is 20php as of 2017. 3. After 3 to 4 weeks, call the PSA contact number provided to you to follow-up on your request. 4. Once availability of document is confirmed, go to the PSA office and request for the SECPA copy (the green-colored paper, which is your NSO Marriage Certificate). DFA - Application/renewal of passport for married females. Processing of migration papers. There are Government Satellite Offices in selected malls (e.g., SM and Robinson's). You cannot request an electronic endorsement here. You can only request for the SECPA copy of the certificate once it's available. PSA won't ask for a reason why you need to have your NSO Marriage Certificate expedited. PSA and NSO are one and the same. PSA is just the new name; NSO is the old name.